This wintry wrap-around bracelet consists of a single length of memory wire, threaded with a host of sparkly glass and shiny metal beads. 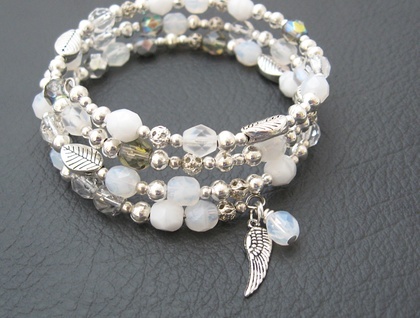 The beads include silver-plated filigree, smooth silver-coloured rounds, leaf-shaped beads, and faceted, firepolished, Czech glass beads in silver, silver-grey, milky white, frosted white, opal white, and translucent grey with a hint of rainbow sheen. 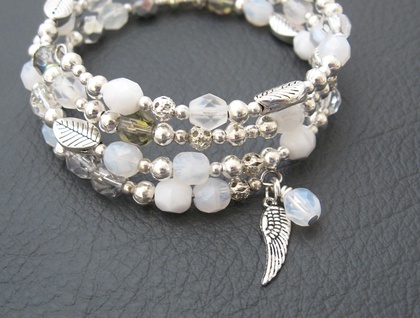 The bracelet is finished with a tiny, antiqued-silver coloured angel-wing charm, paired with another firepolished glass bead in translucent white. Memory wire is very strong and will hold its shape even under great stress – hence the name: the wire 'remembers' its shape. To wear this bracelet, simply wrap it around your wrist. It will stay there until you unwrap it – no clasp necessary. Czech glass is famous worldwide for its high quality. Firepolishing is a technique whereby the beads are 'polished' by subjecting them to a very hot flame, creating a bright, shiny surface. Firepolished glass flashes and sparkles almost like crystal. 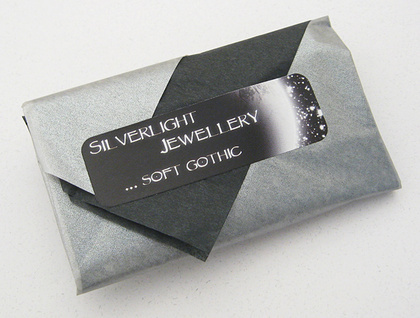 The 'Frost' bracelet has an inside diameter of approximately 50mm, and will comfortably fit a 16cm wrist. 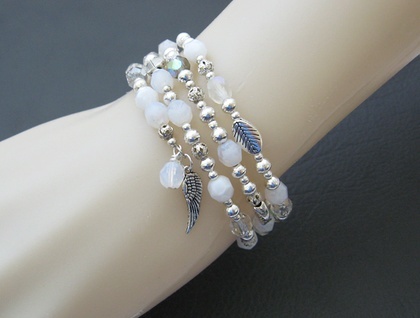 It is designed to wrap three times, giving the appearance of three strands of beads around the wrist. This memory wire bracelet can be made to sit further up on the wrist, like a cuff bracelet, or it can be worn looser and low on the wrist. The slimmer your wrist, the looser the fit will be.